If you’re like most people, you probably keep your shot glasses tucked away with the whiskey, the cocktail shaker and the poker set, only to be pulled out for special evenings of alcohol-spiked socializing. Well, we have a reason to bring those glasses into more regular circulation, but no, we’re not recommending you put more alcohol into that precious body of yours. Quite the opposite in fact. We’re talking wellness shots — a potent little dose of powerful ingredients that will energize your morning routine and deliver an impressive line-up of health benefits. With the ability to detoxify the body, rev up the metabolism and reduce inflammation, these little health-boosting blends may be just the ticket the morning after a night of doing the more traditional kind of shots. Or every morning, for that matter! These days our bodies are bombarded by a constant stream of chemicals and foreign substances that can, over time, accumulate and drag down our overall wellness levels. Keeping on top of a regular detoxification routine can help address this before it ever becomes a problem, and a morning wellness shot is a great way to do this. A morning wellness shot is simply a blend of some of the most active and versatile natural health ingredients, served straight up and taken first thing after waking to start the day off right. Many health shops, juice bars and forward-thinking cafes are now offering this type of elixir, but in case you don’t want to pay the price for convenience (and a plastic bottle you’ll just be chucking into the recycling a minute later), it’s totally achievable to mix up the perfect wellness shot yourself. There are many recipes out there, and you’ll probably recognize some of the common ingredients, which is a star-studded line-up of the A-list of the holistic health world. Things like lemon, apple cider vinegar, turmeric, cayenne pepper, ginger, pink salt and raw honey, all of which have wide-ranging benefits for the whole body. Lemon supports the body’s detoxification processes and provides vitamin C.
Raw apple cider vinegar is packed with probiotics that support gut function and weight loss. Turmeric is an anti-inflammatory superhero, helping relieve pain and prevent disease. Cayenne pepper contains the active constituent capsaicin, which boosts circulation and digestion. Spicy ginger root kicks up your metabolism and regulates blood sugar. Himalayan pink salt provides valuable trace minerals. Raw honey is a sweet source of antioxidants and fights harmful bacteria. Depending on how much time you have and how much effort you want to put into this, there are a few different ways to make your shot. Your choice may also depend on how picky you are with the temperature, flavor and texture. The idea is to make something that you can stick with, and that you will actually drink so that you’ll do the habit regularly. You may need to experiment a little to find which technique suits your schedule and preferences. The easiest way to make a wellness shot is to simply squeeze some lemon juice into a glass, and mix in powdered turmeric, ginger and cayenne pepper. Cut a lemon in half and use a simple lemon squeezer to collect the juice. Spoon 1/4 teaspoon of powdered turmeric, 1/4 teaspoon of powdered ginger and a pinch of cayenne pepper into a small glass. Pour the lemon juice over the spices, stir to suspend the powder in the liquid and drink immediately. While this is the easiest shot, it’s not the tastiest. If you’re willing to put a little more effort in, there are ways to make it more pleasant. For the best chilled experience, use whole fresh root spices and store your ingredients in the fridge so the juice is cold. You can also make a larger batch of juice and freeze it in an ice cube tray, then pop out one cube each morning and let it thaw as you get dressed and ready. You can even serve the cold juice in a frosted shot glass from the freezer. Grate a 1-inch piece of turmeric root and a 1-inch piece of ginger root. Squeeze the juice from the pulp into a small bowl and discard the pulp. Pour the spice juice and lemon juice into a frosted shot glass. Add a pinch of cayenne pepper and drink immediately. Finally, we have the queen of all wellness shots. This recipe takes a few more ingredients and involves a blender to create a top quality smooth texture for your shot. Cut a lemon in half, peel off the skin, remove as many seeds from the flesh as possible, then pop it in the blender. Add a tablespoon of water, a tablespoon of raw apple cider vinegar, a teaspoon of raw honey, a pinch of cayenne and a pinch of pink salt, then blend on high for one minute. 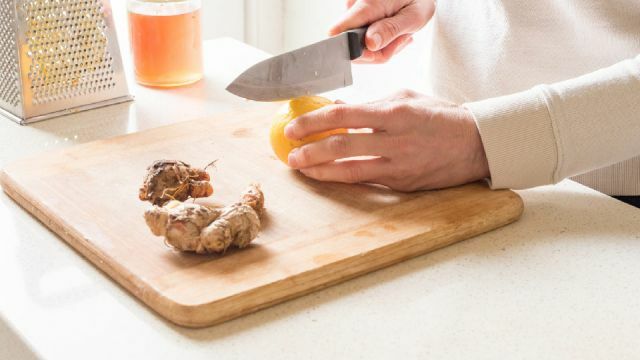 Cut a 1-inch piece of turmeric root and a 1-inch piece of ginger root into thin slices, add to the mixture and blend for one minute. Use a nut milk bag to strain the mixture into your frosted shot glass, then enjoy right away. As with the other recipes, you can make a larger batch in advance and freeze it in an ice cube tray so you have daily servings prepared. However, this may remove some of the probiotic and enzymatic benefits of the raw vinegar and honey. Have you tried making a morning wellness shot? What’s your favorite recipe? Find more detoxifying and health-boosting drink ideas here. Hey Buddy!, I found this information for you: "Energize Your Routine With This Morning Wellness Shot". Here is the website link: https://www.thealternativedaily.com/energize-your-routine-with-this-morning-wellness-shot/. Thank you.